Following bilateral talks with U.S. President Barack Obama, Malaysia's prime minister vowed to work with the United States and like-minded countries to counter the narrative of jihadists. “Malaysia is part of the coalition to fight [the Islamic State group] and can be extraordinarily helpful on issues like countering the destructive and perverse narrative that’s developed,” Obama told reporters Friday in the Malaysian capital. "It's important for us to present the authentic Islam," Prime Minister Najib Razak said after the meeting. In the background of the two leaders' meeting, there was a reported - but unconfirmed – threat linked to the Islamic State group. More than 2,000 soldiers are stationed in Kuala Lumpur to protect the ASEAN summit meetings, and another 2,500 are on standby, according to Malaysia’s army. 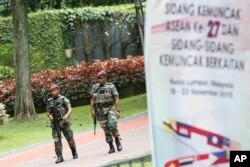 Outside the Kuala Lumpur Convention Center, the main venue for the ASEAN summit, police are posted in tandem with red-beret Malaysian paratroopers armed with M4 carbines. Inside the convention center Friday, Malaysian Foreign Minister Anifah Aman briefed reporters on what ASEAN delegates discussed in their meetings, but did not mention terrorism or take any questions. “It’ll be discussed tomorrow by the ministers,” Anifah said in response to a VOA question after he left the conference hall. The statement was released after police confirmed they had circulated an alert about a meeting last Sunday in the southern Philippines autonomous province of Sulu among elements of the so-called Islamic State, the Abu Sayyaf terrorist group and the Moro National Liberation Front. FILE - Malaysia's defense minister Hishammuddin Hussein gestures as he speaks. “I see certain areas in this region are not being managed well, particularly well, particularly southern Thailand and southern Philippines, not to mention the free movement of peoples and smuggling of weapons,” he said. “These are all issues which need to be taken seriously based on recent developments in Europe and the Middle East. The Philippines’ Jolo island, in the Sulu archipelago northeast of Malaysia’s Sabah province, is a stronghold of the Abu Sayyaf group, known for its bombings and kidnappings of foreigners for ransom. "I will talk tomorrow about some of the threats, what happened in Paris and to our own Malaysian Bernard Then who was murdered in the most horrific manner," Malaysian Prime Minister Najib Razak said on Friday at the opening of the ASEAN Business and Investment Summit. Authorities on Jolo say a severed head was left in a bag in front of a police station there on Tuesday after Abu Sayyaf claimed to have beheaded Then, an electrical engineer, who was abducted in Sandakan, Sabah in May. Malaysian military personnel patrol at the 27th Association of Southeast Asian Nations (ASEAN) summit in Kuala Lumpur, Malaysia, Thursday, Nov. 19, 2015. Authorities on Jolo say a severed head was left in a bag in front of a police station there on Tuesday after Abu Sayyaf claimed to have beheaded Bernard Then, a Malaysian electrical engineer, who was abducted in Sandakan, Sabah in May. “They have clearly shown their presence in this region and the serious danger they pose,” Foreign Minister Anifah said in brief opening remarks at Friday’s meeting of the ASEAN Political-Security Community Council. After last Friday's attacks in Paris by Islamic State terrorists, Malaysian authorities said they doubled security for the ASEAN events. And the regional fight against terrorism clearly is taking a more prominent place on the agenda for leaders meeting here, as it did at the G-20 and APEC gatherings during the past week in Manila.